Interesting answers and mine are a lot of the same:) Enjoy your day dear friend, HUGS! Enjoyed this! I'm with you and the swimsuit, although I do try to get in the pool at the gym once a week. But I keep a towel wrapped around me until the very last minute. Enjoy your weekend. I enjoyed your answers, may have to answer some of my own. Fun questions. It's always fun to see how everyone answers. Enjoy your weekend! Those were some fun questions. I must have my socks off in bed! This was fun learning more about you. Lea, Love your answers; have to tell you I just ordered that charging station and cords for my hubby's birthday. Actually he already got his present, but this will help clean up the counter. Enjoyed your answers Lea. So good to get you a little better. I love the questions. 1: Favorite animal? I am not an animal lover either. But, I do have two grandpups in which I am quite fond of. I have actually baby sat them both several times. (Not because my husband liked it either but felt bad for the grandchildren, LOL) Cute little tiny dogs that are housebroken! 2L Wine or beer? I enjoy a glass of wine once every blue moon. Rare for me but on a special occasion, yes. 3: Socks on/off while sleeping? OFF! NOTHING on my feet! 4: One piece or two piece swim suit. One piece and with a skirt! It is called my little Nana bathing suit. LOL! 5: Cooking at home or eating out? Honestly, I love cooking at home. But once in a while I do enjoy going out to eat as long as it's not fast food. 8: Candy or Chocolate? Chocolate, especially dark chocolate. 9: Coffee or tea? COFFEE for sure. 11: Chick flick, action movie or documentary? Chick flick and action movie. 12: Regular or mechanical pencil. Never use either. 13: Swimming or laying out? LOL! I am one of those gals that likes to get wet, get out, sit in the sun for all about 5 minutes, get back in water and then start over. REALLY rather have the shade with a good book and water. 16: Early bird catches the work or night owl? Neither. I actually am more of mid morning person. 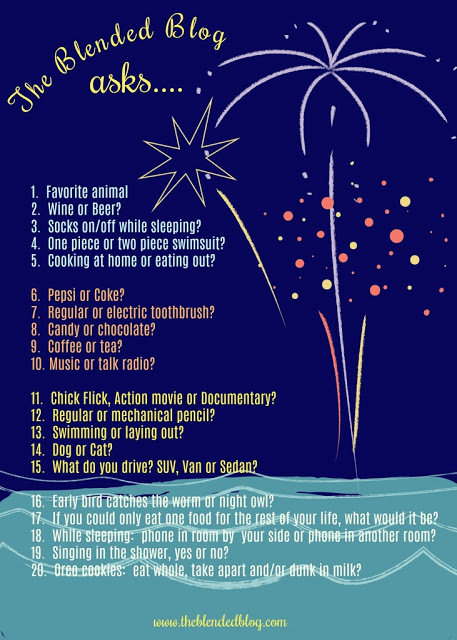 18: While sleeping: Pone in room by your side or phone in another room? Phone is ALWAYS in another room but I too have house phones. One of them is by my bed. 19: Singing in shower, yes or no? LOL! I sing everywhere! Just nowhere anyone can hear me. 20: Oreo cookies: Eat whole, take apart, dunk in milk. I never dunk cookies in milk! And most often I take them apart.